Welcome to the world of Achievement Creation! Technically an achievement is a group of conditions that must be met in a particular frame of the video game. When you launch a game on an emulator with the RetroAchievements feature, the emulator is always checking if those conditions are met in the current frame. When all conditions for a particular achievement are met, it is awarded and the emulator stops checking the conditions for that achievement. Finding a place in the game's RAM where the information you want is stored (examples: level, life bar, time, coins, holding a weapon, get an item, etc.). Create conditions that must be met in order to award an Achievement. Test if your achievement is working as expected. Most likely you'll go back to step 2 and 3 many times to refine the logic of your Achievement. In this doc we'll see how to accomplish the steps above. After you're sure your achievement is triggering at the conditions you want, you can submit it to the server. We'll see more about it later. Before start ensure you have an RA emulator from the RetroAchievements Download Page first and create an account so you can log in using the emulator. In this guide we'll be using RAGens to demonstrate, and the game Sonic the Hedgehog. We are using RAGens but the same applies for the other emulators. To begin, run the RAGens executable, and login when prompted. 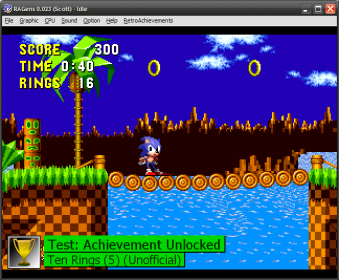 Next, use File -> Open and select whatever ROM you would like to find achievements for. The Memory Inspector can be used to find addresses in RAM for us to use. Essentially you are on a treasure hunt for memory locations - this dialog will help you examine and filter the game's RAM while the game is running. NOTE: If you want a step-by-step video explanation on finding memory addresses, this old video can be useful. 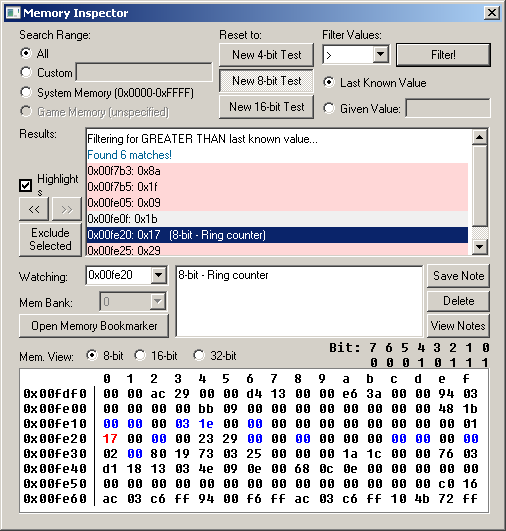 See also: Memory Inspector Overview and Memory Digging Tips. To start or restart a test, click New 8-bit Test near the top middle. Load the ROM and start a new game. Reset the memory dialog: click New 8-bit Test. Return to the game and change the number of rings in memory. For example, collect a ring. In the memory dialog, we now want to filter for values that are 'greater than previous values' (symbol >). We select this, then hit Filter. Each time you perform 3 then 4, the number of possibilities or 'candidates' will get smaller. We will continue doing this until the number of candidates reaches a very small number (as few as possible), it might take 4-5 attempts. 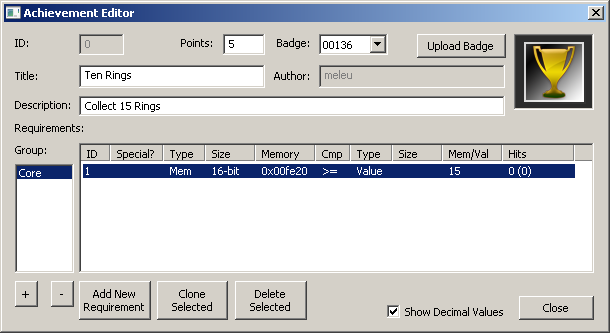 Next we can click in the results window, and monitor the memory address in the memory viewer at the bottom. Continue using the game and you should see the values in memory change as you collect rings. If you don't, or if something doesn't look right, try another value. With the first Sonic the Hedgehog, the memory address for the number of rings should be 0xfe20. Note 1: Using save states (F5 to save state, F8 to load state, F6-F7 to toggle which state to use), you can switch back and forth between different states allowing you to alter what is in RAM, and use this to filter out bad candidates. You can search for values that remain the same (I.e. If you know the value didn't change, use =), or values that are different (use 'not equal', symbol !=). Note 2: There's unfortunately no guarantee from game to game on how the developers have stored their data (4-bit, 8-bit, 16-bit, binary-coded decimals, negative/inverted, i.e. using 0xff/0xffff to represent 'set', or plain randomly), but eventually you should come across some good address. Note if you are struggling to find good values, post RetroAchievements.org Development Help forum, or RetroAchievements Discord server. There are plenty of people who will be very happy to help!! Tip: if you'd like to experiment with memory, try entering new values directly into the RAM viewer. This can have devastating effects on the game, or it might do exactly what you expect, (or nothing at all!) It can be useful though, to see if you can enter a value and get the result you expect. Use with caution! When you've found an address you're happy with, you can write a short note for what it is and hit Save Note, this will store it on database, and will be automatically restored next time you load up the memory viewer for this game, wherever you are! Note that after clicking 'Save Note', the note will be automatically stored on the database, and shared so all developers will share access to these memory notes. They will all be downloaded afresh when you load a ROM. If you try to overwrite a note, it will check with you first before submitting. You can find more useful Memory Digging Tips here. OK so the memory location for the number of rings is stored at 0xfe20 - note to a non-programmer, we're dealing in hexadecimal numeral system which can be daunting, but don't worry, essentially its just numbers and letters instead of only numbers, and not forgetting 0x at the start to show that it's a memory location in hex. We've found an address we're interested in and stored it using Save Note. We now want to create a new achievement. Local Achievements (personal to your PC). In the Achievements dialog, click Local Achievements (top left), then Add New Achievement (top right). This will add a blank entry to the list in the center. Double click on it: if it's not already open, this should select it and open the Achievement Editor dialog. This is the final dialog where we bring all the data together. Most of the top fields are self explanatory, I.e. Title, Description, Points. The main one is the 'Requirements' part. Let's say we want to add an achievement for collecting a certain number of rings. Let's say 15 rings for simplicity. After filling out the fields at the top and selecting a suitable icon (in this example we used the gold trophy badge (00136), but you can upload a new one), we need to fill out Requirements. We have one requirement, that the number of rings is at least 15. Next click is Add New Requirement. Clicking this button will add several default values to the Requirements list. These defaults just ensure that something relatively sensible is added to the list. For now, ignoring the field 'Special?'. When we clicked create, the default memory value will be whatever value you last left in the memory dialog. Cmp: >= - this is the comparison to make. We could have any comparison here, but it's sensible to have "greater than or equal to". This is important because if we get 10 rings then a super ring box to have 20, we would miss out having exactly 15 rings. With that set, we don't have any more conditions to add, so we return to the Achievements Dialog. To be safe, we should save our progress by hitting Save Local! This saves everything to file locally to ensure that we won't lose any progress. Note: usually achievements have more than one requirement to avoid it triggering in a wrong time (i.e. playing demo mode). In this example we are using only one requirement just to simplify the explanation. See more Achievement Creation Tips here. We can now 'activate' this achievement locally by hitting Activate on the right-hand side. This will start monitoring these memory locations and will award the achievement once all the conditions are true. Now we can go ahead and test to see if this achievement works! If we press Esc n-game, you will see the achievement show up as a demonstration of what it would look like in the in-game overlay! Although the achievement worked fine in our tests, an achievement with a logic like that is not ready to be officially released. First of all: it has only one condition: "collected rings >= 15". The problem is that the memory address used to record the number of collected rings is also used when the game runs in "demo mode" (AI playing the game after your wait a while on the title screen). 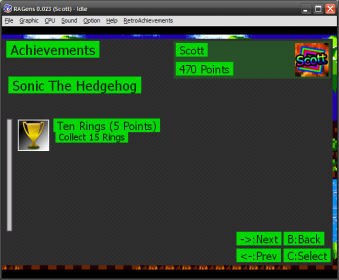 So, if Sonic collect 15 rings on demo mode this achievement will trigger, which is unwanted. Check the tips in the next section below to know how to improve the logic of your achievement and then make it accepted to be officially released. If the game has a demo mode (AI plays the game after you wait a while on the title screen), make sure to find the address for it and add a condition so your achievements don't trigger in demo mode. You'll also need to know how to use PauseIf and ResetIf. PauseIf cheat codes: If the game has a cheat code to increase lives, select stages, etc. Make sure to find the addresses for it and add some kind of protection in your achievements. OK, maybe it's not a very basic topic, but you have to keep it in mind when creating an official achievement set. Avoid creating achievements for just entering on a stage. As it can be earned by a password or a stage select cheat code. Prefer to make achievements for finishing a stage, like in this template here. Also, do not create achievements for just starting a game or "starting a game with character X". If you wanna create an achievement for getting a specific and unique item in the game, add some conditions to make sure the player got the item where it is supposed to be obtained, like in this template here. Otherwise the achievement will be earnable using password or loading a saved game. Avoid making too many achievements about simple things that need near to no effort. Examples of what NOT to do: get one coin or one mushroom on Super Mario Bros.
Be aware of the unwelcome achievement's design concepts. Be creative with your achievements. Those covering unique features and details of the game are the most welcome. The players love when that little detail of a game they love is supported on an achievement. Reading a Walkthrough on GameFAQs can give some inspiration too. Try spending on the game as much of the time as possible, especially if it's your first attempt on developing achievements. It takes time to know the game more from the inside, and how the memory works there is the best source of ideas for unique achievements. You can find more in the Tips and Tricks page. In order to refine your achievement logic, you can see what features you have in the Achievement Logic Features page. You can learn by looking at existing Achievements that other devs made with an extra explanation in the Real Examples page. You can also see some generic examples in the Achievement Templates page. Once you learned all the basic techniques, if you want to get the Developer status you must follow the steps explained here: How to Become an Achievement Developer. [2018-09-05 05:13] meleu: decreased verbosity and added a link to "how to become an achievement developer"
[2018-08-06 11:51] Ben-Ghazi: Updated location for "Add New Achievement" button.